Here's why Visa, EPAM Systems, and CVS Health could all be bargains hiding in plain sight. With stocks soaring since the presidential election, there isn't a lot of obvious value to be found in the market today. But thankfully, even during times of euphoria, investors can still find bargains if they are willing to turn over enough rocks. With that in mind, here's why I think value-focused investors should consider picking up shares of Visa (NYSE:V), EPAM Systems (NYSE:EPAM), and CVS Health (NYSE:CVS). Given the ubiquity of credit and debit cards in North America, you might assume that the growth prospects for a payment processing company like Visa are limited. I thought so too until it was pointed out to me that 85% of global transactions still occur using cash or check. That means there is still a huge growth runway ahead for this $200 billion giant. Beyond convincing more consumers to switch to plastic, Visa also has another revenue and profit growth opportunity ahead. In late 2015, Visa acquired Visa Europe, a business that was separated from the mothership prior to the company's IPO. Now that these two companies are back joined at the hip, Visa stands to benefit from additional volume and economies of scale. That should easily add a few percentage points of growth to the company's top and bottom lines. While Visa's trailing PE ratio of 35 might make you question my claim that this stock is a bargain, I'd retort by pointing out that its forward PE ratio is only 23. That still might not look classically cheap, but since Wall Street expects Visa to expand its EPS by more than 16% annually over the next five years, I think investors who buy today are getting a good deal. Companies of all different sizes often need to create custom software solutions to help them effectively manage their business. However, not every company has the technical expertise to make a useful product, which is why they often outsource the work. With a worldwide army of more than 20,000 engineers, designers, and consultants at its disposal, more and more companies are choosing EPAM Systems as their go-to partner. What's wonderful about EPAM's business is that its clients' products tend to need constant tinkering. This means once a customer becomes comfortable with EPAM, they tend to stick around and offer the company more work. That provides EPAM with a recurring source of revenue, which makes its financial statements highly predictable. In fact, management believes that almost 90% of the company's total revenue is accounted for at the beginning of the year. This makes it easy for the company to plan its expenses for the year to ensure that profits consistently tick higher. Looking ahead, the demand for IT outsourcing is likely to continue to grow as the business world becomes increasingly automated. Given that EPAM is becoming a partner of choice, market watchers are projecting that the company's profits will grow by more than 17% annually from here. With shares trading around 18 times forward earnings, I think EPAM is a growth stock that even value investors can learn to love. 2016 wasn't a great year for CVS Health. Investors learned that two major pharmacy accounts -- Tricare and Prime Therapeutics -- decided to leave CVS and signed on with Walgreens Boots Alliance instead. That action is expected to transfer roughly 40 million prescriptions from CVS Health to Walgreens this year, which is a sizable hit. As a result, management is projecting that adjusted earnings per share in 2017 will be roughly flat year over year. 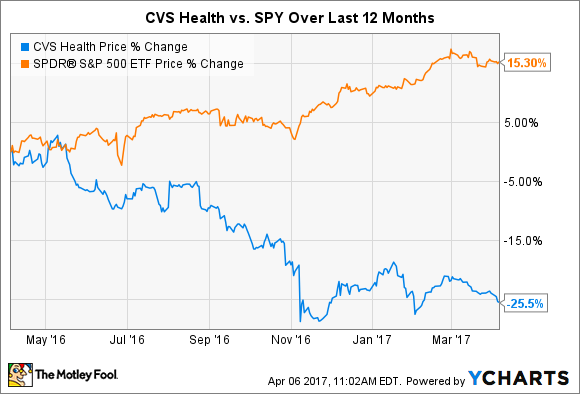 When adding in the potential dismantling of the Affordable Care Act and the political attention on drug prices, it is easy to understand why CVS Health has vastly underperformed the S&P 500 over the past year. Thankfully, while the last few months have been tough, CVS Health continues to offer reasons to believe that its long-term growth story is still intact. First, the American population is aging, which should keep the demand for retail pharmacy stores and pharmacy benefit managers high. Next, CVS Health is still digesting its two big acquisitions from 2015, so there are plenty of gains to be had from streamlining operations. Finally, CVS Health continues to crank out copious amounts of free cash flow that it can use to increase its dividend and buy back stock. Given all of the above, it's understandable why analysts are projecting that the company is still capable of producing double-digit EPS growth over the long term. With shares trading around 12 times forward earnings and offering up a juicy 2.6% dividend yield, CVS Health could be a bargain hiding in plain sight.